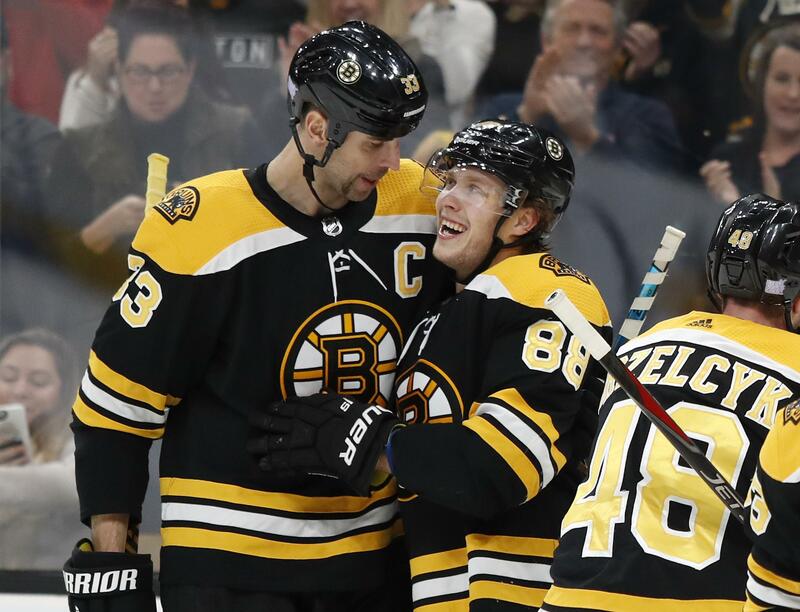 Sat., Nov. 10, 2018, 11:36 p.m.
BOSTON – David Pastrnak had three goals and an assist to lead the Boston Bruins to a 5-1 win over the Toronto Maple Leafs on Saturday night. COLUMBUS, Ohio – Jimmy Vesey scored in the fifth round of the shootout to give New York its fifth win in six games. Vesey beat goalie Joonas Korpisalo after the Blue Jackets’ Oliver Bjorkstrand was stopped by Alexander Georgiev as the Rangers improved to 5-0-1 in its recent stretch. RALEIGH, N.C. – Anthony Mantha scored twice and Frans Nielsen got the deciding goal in the shootout to lead Detroit. DALLAS – Mattias Ekholm scored 2:27 into overtime, and Nashville rallied to beat Dallas. The Predators (13-3-0) improved to 8-0 on the road this season. They rallied to tie the game three times, the last on Roman Josi’s power-play goal with 43 seconds left in the third period. PHILADELPHIA – Sean Couturier had two goals and an assist, Brian Elliott made 33 saves and the Flyers continued their dominance over slumping Chicago in Philadelphia. BUFFALO, N.Y. – Jeff Skinner and Sam Reinhart rallied Buffalo with goals late in the third period, and Jack Eichel and Casey Mittelstadt scored in the shootout to beat Vancouver. PITTSBURGH – Sidney Crosby had a goal and an assist, Casey DeSmith stopped 39 shots and Pittsburgh snapped a five-game losing streak. The skid was the Penguins’ longest since it lost five in a row from Dec. 11-19, 2015, which included the first four games under coach Mike Sullivan. The Penguins haven’t lost six straight since 2006. Pittsburgh also ended a four-game home losing streak and continued a six-game points streak against Arizona. SUNRISE, Fla. – Aleksander Barkov scored the go-ahead goal in the third period to lead Florida. TAMPA, Fla. – Rookie Brady Tkachuk had a goal and an assist, and Ryan Dzingel scored a tiebreaking goal during Ottawa’s four-goal third period to rally the Senators past Tampa Bay. Tkachuk, the No. 4 overall pick in the 2018 draft, was credited with his fourth goal of the season when Lightning defenseman Dan Girardi’s clearing attempt near the goal line wound up in the net early in the third. MONTREAL – Andrew Shaw scored twice, Tomas Tatar had the go-ahead goal and Montreal spoiled Max Pacioretty’s homecoming. LOS ANGELES – David Rittich stopped 21 shots for his first career shutout and Travis Hamonic scored to help Calgary win for the fifth time in six games. Published: Nov. 10, 2018, 11:36 p.m.